The Doom That Came To Atlantic City, a board game that raised nearly four times its funding goal on Kickstarter last year, has been canceled as the founder admits that the whole thing was "beyond his abilities." It's the worst possible outcome for a Kickstarter: People love the idea, supporters throw truckloads of money at it and then a year down the road, it all falls apart amidst accusations of wrongdoing. 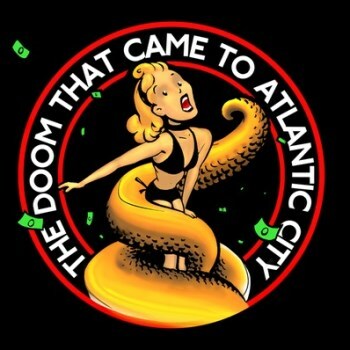 That's exactly what happened to The Doom That Came To Atlantic City, a Kickstarter project that went live last May with a goal of $35,000 that ultimately raised over $122,000, but that has now plunged into oblivion. "The project is over, the game is canceled," Erik Chevalier, founder and publisher at developer The Forking Path, wrote in a Kickstarter update yesterday. "After much deliberation I've had to make this decision. I've informed Keith [game designer Keith Baker] and Lee [artist Lee Moyer] and neither at all happy with this situation. Every possible mistake was made, some due to my inexperience in board game publishing, others due to ego conflicts, legal issues and technical complications. No matter the cause though these could all have been avoided by someone more experienced and I apparently was not that person." The collapse of the Kickstarter is bad enough, but the real anger seems to be reserved for Chevalier's statement that the goal wasn't actually to make the game at all, but to make a game company. "From the beginning the intention was to launch a new board game company with the Kickstarted funds, with The Doom that Came to Atlantic City as only our first of hopefully many projects," he wrote. "Everyone involved agreed on this." The trouble with that claim is that the Kickstarter pitch video completely contradicts it. In it, Moyer talks about the 20-year evolution of the game, and nothing else. "We're finally ready. 20 years on, it's done, it's ready," he says. "The stars are right for The Doom That Came To Atlantic City. I hope you'll join us on this wild ride." And while he specifically cites the participation of Baker and sculptor Paul Komoda, Chevalier's name isn't mentioned once. Reaction among backers is about what you'd expect. A few have expressed understanding and sympathy, some have accused it of being a straight-up scam and many others have pointed out that their money was intended to support a game, not the foundation of a new company. One user claimed that after contacting Chevalier, he was told that all art rights have been returned to the game's creators and he thus can't sell any related content for more funding - not that there's much in that pipe anyway. "No pewter figures were ever produced and the t-shirts were going to be printed closer to release, which now isn't happening," he allegedly wrote. As for refunds, Chevalier said that he hoped to provide them but made it clear that breath probably shouldn't be held. "Unfortunately I can't give any type of schedule for the repayment as I left my job to do this project and must find work again," he wrote. "I'll create a separate bank account to place anything beyond my basic costs of living. Every time that account has a decent amount saved into it I'll issue a payout to a portion of the backer list. I'll post updates with each payout to keep you all informed on the progress." "Again, I never set out to con anyone or to perpetrate a fraud but I did walk into a situation that was beyond my abilities and for that I'm deeply sorry," he concluded. "This has been a rough year, I never wanted to make it harder for anyone. There will be no more monthly updates, not that there have really been in some time, but I will post with each payout, as well as the post-mortem when it is eventually complete." Yet as Mighty Rabbit Studios pointed out, it's not the first time Chevalier has been involved in an ill-fated game venture. Prior to The Forking Path, he was the founder and lead designer at Inari, Inc., one of the first five indie game outfits formed by "accelerator" Joystick Labs. The comment claims that Inari got $20,000 to create a "social pinball game," which it burned through in six months with nothing to show for it, and while there's no evidence of those details, there's no question that Chevalier headed Inari, and Inari is now gone. And perhaps lending some credence to claims of wrongdoing is a message posted by Baker claiming that neither he nor Moyer had anything to do with The Forking Path. "Neither one of us received any of the funds raised by the Kickstarter or presales," he wrote. "I haven't received any form of payment for this game. Lee and I were not involved in the decisions that brought about the end of this project, and we were misinformed about its progress and the state of the game." The upside is that he and Moyer still want to get the game out to backers; the downside is that it will be a "print-and-play" version - do-it-yourself, in other words - and that they don't have access the backers list. Anyone who backed the game, or knows someone who did, is encouraged to contact Baker at Keith-Baker.com. It's a sad situation for all involved, and it once again drives home the point that Kickstarter is a roll of the dice. Money spent backing them should be treated like money lost, and if you can't afford to lose that money, then you should probably find something better to do with it.